Anthony Marinelli, one of the music world’s most lauded composers, is back to spot work after writing the soon to be Broadway musical Bollydoll. Marinelli is probably best known for his creative collaborations and music for some of the ad industry’s most iconic spots (Apple, Shell, Portland Gas, Mercedes, along with PSAs for the California Department of Health Services and the “This Is Your Brain on Drugs” campaign by the Partnership for a Drug Free America). In addition to spot work, Marinelli has composed music for over 70 features films, in addition to musical collaborations with such iconic talents as Herb Alpert, Lionel Richie, Chuck D and Michael Jackson. Marinelli has spent most of the last 2 1/2 years writing Bollydoll, a Broadway musical, animated film and dance spectacle. Created by Amrita Sen and Marinelli, Bollydoll incorporates immersive visual worlds, dancing and singing to infectious vocal hooks that channel funky East Indian, African and R&B influences. The show, featuring forty songs, thirteen dancers, and projected animation, opened with Sia for Deepak Chopra’s Sages and Scientists Symposium, and was first presented in a geodesic dome at Vortex Immersion/LA Center Studios. “What really sets Bollydoll apart is how it deliberately and seamlessly integrates original story, characters, music choreography, artwork, animation, fashion and education into a unified experience for the audience,” says Marinelli. For part of the campaign Marinelli collaborated with neo soul rock band “The Heavy” and three time Grammy winner Asdru Sierra from Ozomatli. The campaign “Jaguar at Play” features a mix of flamenco guitars, Afro Cuban percussion and Asdru Sierra’s take on Tuvan throat singing. “Little Less Conversation” is a cover of the famous song written by Mac Davis and Bill Strange, made iconic by Elvis Presley. “Heritage is an emotional anthem composed of South American guitars, electric and acoustic guitar, live drums and bass, all performed to electronic pulses. ”It Plays Well/No Mere Machine/Everyday/Too Much” features stunning vocal performances by Amrita Sen and Sierra over driving flamenco guitar rhythms and Cuban percussion. “Machines” features industrial music and sound design created with analog synthesizers and drum machines with vocals by Heather Bradley. “More Alive” was recorded with a real 60-piece orchestra. Anthony Marinelli has compiled a special catalog of scores for agency creatives to access. “This is not a music library,” says Marinelli. “This is my personal catalog of “real” film scores, that have been vetted to the standards of the most demanding film directors and producers. I have written music for orchestras, small ensembles and live performances by hit-making musicians. These are not demos. There are fresh, emotion rich, long-form ready scores, perfect for ad and social media campaigns. Score catalog offers clients the advantage of one stop licensing (to avoid negotiations and unpredictable outcomes from multiple rights holders). It also allows creatives to take advantage of music that has not been overused or exhausted.” Spot credits utilizing the Score Catalog include work for Washington Lottery, Adidas, DHL, Lipitor, Ortho, IBM and Habitat For Humanity. You’ve heard Anthony’s work in hundreds of iconic spots for Apple, the memorable “This is Your Brain on Drugs” spot, Super bowl ads for Budweiser and Accenture, work for Shell, Jaguar, Mercedes Benz, Fancy Feast, Boeing, and more. He’s composed classic Disney jingles, logos for Paramount and Morgan Creek, along with original music for over 70 feature films including Young Guns, 2 Days in the Valley, Planes Trains and Automobiles and Leaving Las Vegas. He’s arranged and performed for the Olympic opening ceremonies, the FIFA World Cup and Super Bowl XXVII's halftime show. He’s played keyboards on records with James Brown, Lionel Richie, Chuck D, Afrika Bambaataa, and Michael Jackson’s mega hit album “Thriller.” For the past several years, Anthony and Amrita Sen have co-created an entertainment venture called BollyDoll Entertainment that expands an existing retail brand through their original songs, live dance shows, and animation. Anthony Marinelli is all about music, with a unequaled talent for creating tracks that everyone loves and remembers. Along with his Music Forever team, Marinelli has the right contacts and a love for collaboration, combined with the ability to solve problems and a relentless drive to find for his client that musical “needle in a haystack.” From effortlessly hip collaborations with some of today’s great artists to award-winning music/sound design for movies, spots and theatrical productions, Anthony Marinelli continues to excel. To have him work on your special project go to www.anthonymarinelli.com. Excerpt from "Afternoon Conversation: A Hero’s Story. Pop Music. 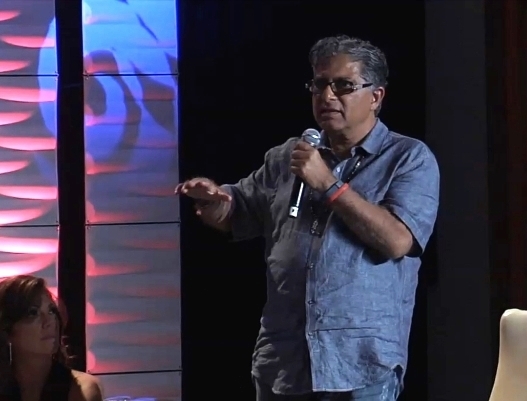 World Class Dance"
As part of Deepak Chopra’s Sages and Scientists 2014 symposium, Anthony and Amrita had the pleasure of discussing their creative process as co-creators in BollyDoll. The Merging of a New Future will explore a series of fantastic emerging facts designed to include forward thinking Sages and Scientists who are leading experts in the areas of science, consciousness, leadership, wellbeing, peace and justice, social and economic issues and art and culture. – Some of the most urgent questions facing our future evolution will be addressed. BollyDoll is an original story of two princess sisters that band together to restore order in the universe through a life changing journey of self awareness in the deep cosmos. With the help of the Sun, Moon, a prince and a sagely comet, they return home transformed to reunite their kingdom with true love, leadership and enlightenment. The princesses learn to improvise, overcome and adapt to the obstacles that stand between them and the realization of their dreams. Timeless characters dance through animated worlds projected on visually stunning giant screens surrounding the audience. Unforgettable songs, where hip hop meets Bollywood, live singing and other-worldly sounds present a soundscape of heightened imagination. BollyDoll transports audiences of all ages to a distant time and space centered around classic India. You may remember Amrita from the performance of “Jai Ho” at the 2009 Academy Awards, where she performed the winning song from the movie Slumdog Millionaire Amrita has sung on records with Weezer, Timbaland, Pitbull, Ozomotli and Justin Timberlake and has written and performed multiple movie and film titles with her signature Bollywood vocals. You can hear Amrita in various commercial campaigns including Honda, Jaguar and Sprite. Amrita, is also a trained visual artist, who debuted her illustrations at Art Basel in Miami Beach, sponsored by Illy Coffee and presented by Timbaland. BollyDoll merchandise brings colorful characters and patterns to a comprehensive array of fashion accessories (handbags, scarves, costume jewelry, and sterling silver jewelry) and home goods. Amrita’s hand illustrated designs are currently featured nationwide in Nordstrom, Dillard’s, Fred Segal. “BollyDoll for MAC” cosmetics is upcoming. I had a great time down at Vintage King the other night. Looking forward to more opportunities to work with the great people behind these awesome products. Two of the top pieces of gear to come off the AES 2014 floor, the Solid State Logic XL-Desk and the Barefoot Sound MicroMain45 monitor, are getting special demos at Vintage King Audio in Los Angeles and Nashville. As an exclusive to Vintage King enthusiasts, these special events offer attendees the first time to demo both of these innovative new products. Pictured at Vintage King Los Angeles are (L-R) Jeffrey Ehrenberg, VK West Coast Sales Mgr. ; Fadi Hayek, SSL VP Music Products; composer/producer Anthony Marinelli; and Tedi Sarafian, Barefoot Sound CEO. Photo by David Goggin.